U. NOTTINGHAM (UK)—Taking smoking completely out of children’s lives—including a ban in private homes and vehicles—is the only way to protect them from the dangers of passive smoke and the chronic diseases they cause. 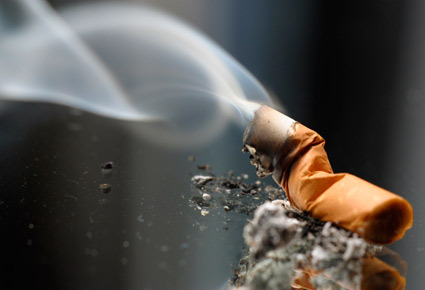 Children subjected to passive smoking face an increased risk of lower respiratory tract infection, asthma, middle ear disease, and bacterial meningitis, according to a new study for the Royal College of Physicians that was funded by Cancer Research UK. John Britton, professor of epidemiology at the University of Nottingham and director of the UK Centre for Tobacco Control Studies (UKCTCS) contributed to the report that, among other things, highlights the risks of maternal smoking and shows that living in a household in which one or more people smoke more than doubles the risk of sudden infant death. Passive smoke also stores up problems for future generations because children growing up with parents or siblings who smoke are around 90 percent more likely to become smokers themselves. “This report isn’t just about protecting children from passive smoking, it’s about taking smoking completely out of children’s lives,” Britton says. Each year in the UK, passive smoking causes around 20,500 new cases of lower respiratory tract infection in children younger than 3 years, 121,400 new cases of middle ear disease in children of all ages, 22,600 new cases of wheeze and asthma, and at least 200 cases of bacterial meningitis. These cases of disease result in over 300,000 general practice consultations, and about 9,500 hospital admissions each year, the study says. The team studied only the more common and other selected disease outcomes, which suggests the figures underestimate the true burdens of disease caused by passive smoking. What’s more, the entire excess disease burden is avoidable, Britton says. One of the biggest impacts of smoking around children is that adult smokers can be seen as role models, increasing the likelihood that the child will, in due course, also become a regular smoker, writes Liam Donaldson, chief medical officer for England and Wales, in the report’s forward. Preventing this means that adults take responsibility to stop smoking in front of their children at home, or in places where children may see them smoke. Success will demand far more radical approaches to tobacco prevention, particularly in terms of price, mass media campaigns, and the consideration of generic packaging, and wider smoke-free public policy covering cars, entrances to public buildings, parks, and other outdoor places frequented by children. Protecting children is a health priority, he says, and adult smoking behaviour must radically change to achieve that. “The Royal College of Paediatrics and Child Health has recently led on the call to ban smoking in cars with children travelling in them,” says Terence Stephenson, president of the Royal College of Paediatrics and Child Health (RCPCH). “We should be making cars totally smoke-free if there are children travelling in them. Second-hand smoke has been found to be strongly linked to chest infections in children, asthma, ear problems and sudden infant death syndrome, or cot death.